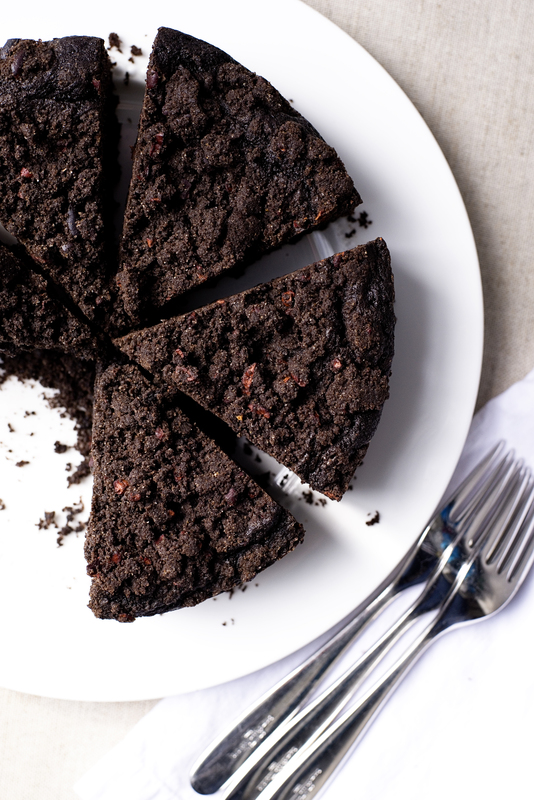 Chocolate-Rye Crumb Cake + 5 Chocolate Desserts to Get You Through Winter! I flagged this recipe from Bon Appétit a couple of months ago, placed the magazine on top of a collection of sloppily organized cookbooks and walked away. Weeks passed, more snow fell, kids got sick, training runs got longer and more depleting, I avoided my cookbooks and magazines. I made easy comfort food and desserts. My cooking self hibernated, hunkered down, got through…winter. It wasn’t until last week I felt motivated to make something new. Maybe the sudden sound of songbirds in the early morning, or the longer days woke me up. I can’t say. Maybe spilling the red bowl of Kosher salt that sits next to stove near the cookbooks was the catalyst for cooking something new. The spill did force me to clear the entire counter, wipe it down and then sort of organize my cookbooks and magazines. So forget the songbirds or the longer days. My clumsy self set off a series of events that forced my withdrawn self to wake up. 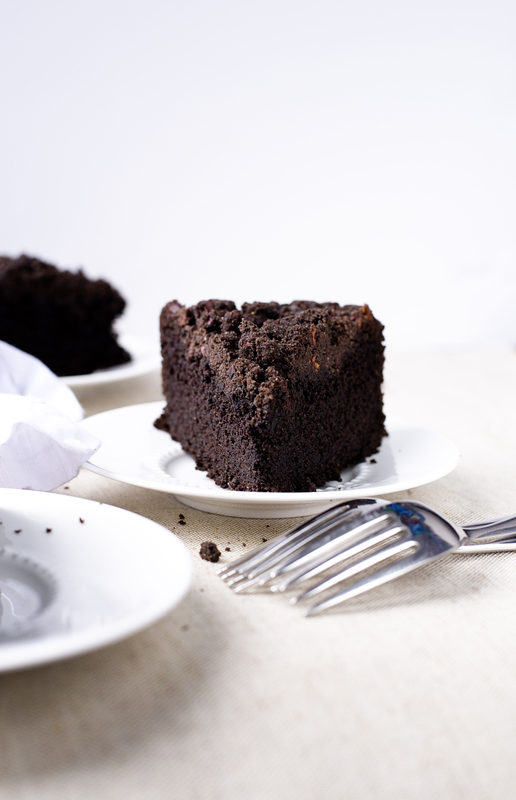 Or least make this long forgotten recipe: chocolate-rye crumb cake. I have never baked with rye flour. As I folded the dry ingredients into the wet mixture, the dough became quite sticky and dense. I thought about throwing it out, but I carried on, spread the batter into my prepared pan and sprinkled the top with the cacao nib crumble. 55 minutes later the cake was ready. I let it cool and went about my day. (This is not normal behavior, I know. Fresh chocolate cake sitting on the counter begs for a knife and fork, and a plate is optional.) I guess I assumed the cake would taste like cardboard, despite containing plenty of butter and sugar. I should never assume anything again. One bite and I was hooked. Moist and tender with a mellow rye flavor, this chocolate crumb cake is one I will make for years to come. The chocolate flavor is robust and overpowers the rye flour, but that doesn’t bother me. The crumble, similar to chocolate cookie crunches, but not nearly as processed, is the highlight of the cake. The cacao nibs add a pure chocolate element to the cocoa powder. Then all of that antioxidant wholesomeness pairs perfectly with butter and sugar. Can it get any better? I doubt it. Enjoy! Pre-heat your oven to 350F. Spray a 8×2 inch round cake pan with non-stick spray. Set aside. Whisk together flours, baking powder, cocoa powder, baking soda and salt in a medium bowl. Set aside. Using a stand mixer with a paddle attachment beat butter, sugars on medium-high speed until light and fluffy or about 5 minutes. Scrape down the sides of the bowls and add your eggs and vanilla. Mix for another 2 minutes. Reduce speed to low and add half of the dry ingredients, then the buttermilk. Mix well. Add other half of dry ingredients followed by the yogurt. The batter will seem stiff and sticky. That’s ok! St. Patty’s Day is next week so why not celebrate with stout cupcakes with chocolate covered pretzels or triple chocolate Guinness cookies. Beer and chocolate almost always taste good together! I have a tub of mascarpone sitting in my fridge and now I have a plan: chocolate mascarpone cake with berries. Raspberry season is coming. If you see some raspberries at the grocery store, buy them and make double chocolate raspberry brownies. Go ahead, treat yourself! My brownie pie will help soothe your winter blues, I promise.